Publicity for the avidly awaited Harry Potter spin off, Fantastic Beasts And Where To Find Them has been gaining momentum this week. 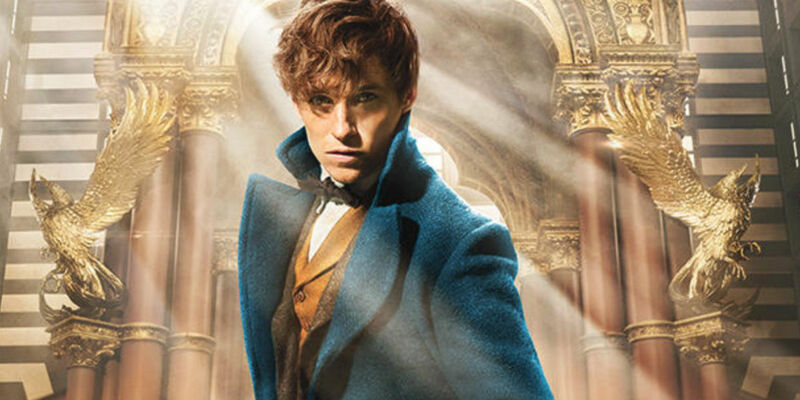 Key details of the highly secretive film have been released, along with images showcasing Academy Award winner Eddie Redmayne as magizoologist; Newt Scamander. Fans have also been given a new Harry Potter universe slang term to learn - namely the American-ism for 'muggle' - with more promised to come when the movie is released. However, the vital information that fans will be keen to discover is which of the eighty five fantastic beasts described within J.K. Rowling's source book will be featured in the movie. Fantastic Beasts is set in t1926, as Redmayne's eccentric wizard and magizoologist character arrives in New York, with his illusionary case containing rare magical creatures collected from his travels. Rowling has debuted as a screenwriter for this adaptation of her book, which was charitably released as Harry's textbook from Hogwarts and published fictitiously (naming Scamander as the author). The Warner Bros. movie, which started filming in August this year, is directed by David Yates (the final four Harry Potter movies) and features Colin Farrell (True Detective), Katherine Waterson (Inherent Vice), Alison Sudol (Transparent), Dan Fogler (Balls Of Fury), Ezra Miller (The Perks Of Being A Wallflower), and Samantha Morton (Minority Report) in key roles. Bowtruckle: A very small, stick like creature made from bark and twigs that camouflages itself in trees. The Bowtruckle was featured in Harry Potter And The Order Of The Phoenix and this particular one will apparently live in Scamander's pocket. Merpeople: An underwater species with varying appearances and demeanor depending on their global location. Rowling introduced these mermaid type creatures in Harry Potter And The Goblet Of Fire. Augurey: The Irish version of the typical phoenix seen in Harry Potter And The Order Of The Phoenix, they are smaller, greenish black and can forecast rain or possibly death! Augurey's have been featured in two Harry Potter video games; The Philosopher's Stone and The Chamber Of Secrets. Ashwinder: A pale, red eyed serpent born from unguarded magical fires that can lay very dangerous but potently magic eggs. Lethifold: Also known as a living shroud, a carnivorous, cloak like creature known to glide over surfaces suffocating and consuming people. Crup: A muggle hating wizard companion resembling a Jack Russell Terrier with a forked tale and an insatiable appetite. Despite only one of these creatures being confirmed, EW have been consistent with exclusive news for Fantastic Beasts as of yet - and this seems like a fairly diverse selection of Rowling's creatures varying from cute to terrifying. These creatures would all be visually compelling when actualized on screen. If this is the beginning of a new series, no doubt many more Beasts will feature. Speculating about a new offering to any franchise is part of the fun too, especially considering we have a year to wait for the final product. Although this movie is in no way a direct prequel to the Harry Potter series, it will provide an interesting historical context for the world fans have grown to love. The 1920s time frame will allow for an added richness that differentiates the movie from Harry Potter whilst retaining the continuity expected from the franchise's regular director and Rowling's personal input. Fantastic Beasts And Where To Find Them will be released in U.S. theaters on November 18th, 2016.